Apple has released a new model of it’s Cinema Display and added Thunderbolt support. The Apple Thunderbolt Display is a 16:9 widescreen with 2560 x 1440 resolution. It includes a Thunderbolt connection turning the display in a hub with 1 FireWire 800, 3 USB 2.0, 1 Gigabit Ethernet and an additional Thunderbolt port to connect a second display. The Apple Thunderbolt Display is available at the Apple Store for $999. CUPERTINO, Californiaâ€”July 20, 2011â€”AppleÂ® today unveiled the new Apple Thunderbolt Display, the worldâ€™s first display with Thunderbolt I/O technology and the ultimate docking station for your MacÂ® notebook. With just a single cable, users can connect a Thunderbolt-enabled Mac to the 27-inch Apple Thunderbolt Display and access its FaceTimeÂ® camera, high quality audio, and Gigabit Ethernet, FireWireÂ® 800, USB 2.0 and Thunderbolt ports. Designed specifically for Mac notebooks, the new display features an elegant, thin, aluminum and glass enclosure, and includes a MagSafeÂ® connector that charges your MacBookÂ® Pro or MacBook AirÂ®. 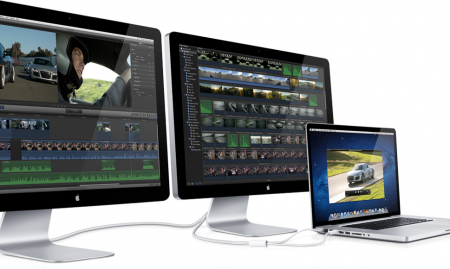 The Thunderbolt Display is the worldâ€™s first display to include Thunderbolt I/O technology. Featuring two bi-directional channels with transfer speeds up to an amazing 10Gbps each, each Thunderbolt port delivers PCI Express directly to external peripherals such as high performance storage and RAID arrays, supports DisplayPort for high resolution displays and works with existing adapters for HDMI, DVI and VGA displays. Thunderbolt-based Macs with discrete graphics can drive two external displays giving professional users over 7 million additional pixels of display real estate and the ability to daisy chain additional Thunderbolt devices, as well as video and audio capture devices. The new Thunderbolt Display will be available within the next 60 days through the Apple StoreÂ® (www.apple.com), Appleâ€™s retail stores and Apple Authorized Resellers for a suggested retail price of $999 (US). The Apple Thunderbolt Display requires a Mac with a Thunderbolt I/O port.